Enhancement in OpenERP Point of Sale for Gift Coupon feature. This feature is very important when we are dealing with gift coupons in our routine life. Lets see how this is working. 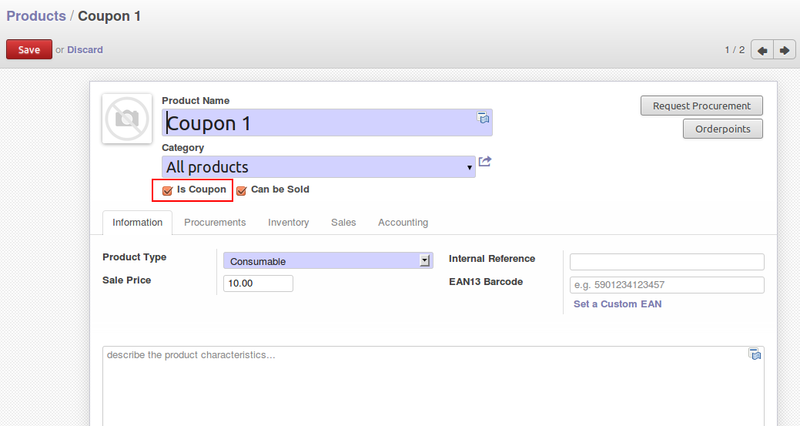 First of all we have to create coupons in OpenERP as a normal product but having Coupon option true. In below screen we can see that only products having quantity > 0, and with 2 options for coupon feature. Create coupon from POS is also possible, and Show all coupons. This view is to create coupon from POS. We can define validity periods so dates will be automatically calculated. Once we create coupon, POS will load all products having Coupon = True. So these coupons can be allocated to our customers. We have receipt with barcode, and other information like expiry date and all. Here is the list of coupons when we click on “All Coupons”, but with condition that validity should be greater than today, and remaining balance also should be bigger than 0. Now we have another option in the backend to check created coupons and history. Now lets see how to use this coupon during POS payment. Here we have option to add multiple coupons and immediately available balance will be appear as soon as we select coupon barcode number. Once we process for payment, so coupon amount will be appear on receipt also. Now in the backend, we can see remaining balance is decreased. We have history also maintained here which are actually used on particular date with amount. Now if we try to use amount which is bigger than available balance in coupon, then also POS will not allow us to do that.